Amusewiki, beside the usual output formats (HTML, EPUB, LaTeX, HTML), is able to create slides in PDF via the Beamer package with LaTeX. The slides feature is off by default, but you can easily activate it in the admin console with the checkbox under “Formats”. in the editing screen (i.e., in the .muse file). It's important to note that the slide material must be placed inside a section, no matter how deep. Material at the beginning of the text, not belonging to any section, is just ignored. You can exclude sections of the documents from the slides by placing a comment cookie in the excluded sections. This is useful if you want to create slides and handout from the same source (as you should). 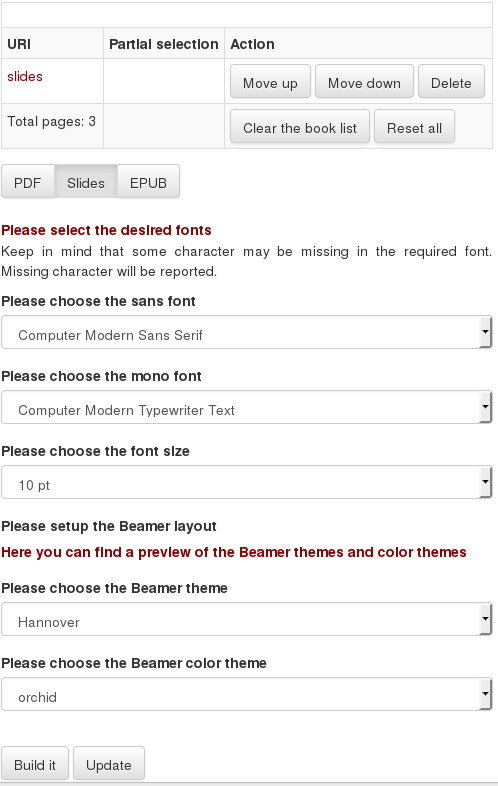 Finally, when you have the document ready, you can change the theme, the colors and the fonts adding it to the bookbuilder (using the button in the text's infobox) and asking for slides. Again, Here we can write something which doesn't end up in the slides. Again, Here we can write something which doesn't end up in the slides. See the produced formats.